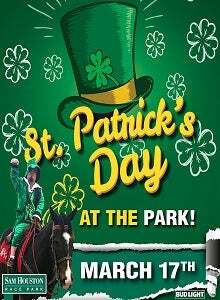 (Houston, TX) – The 2018 Sam Houston Race Park Thoroughbred racing season will conclude on Saturday, March 17. The evening will include the running of the $65,000 Jim’s Orbit and $65,000 Two Altazano as well as the presentation of the end of the meet awards for leading jockey, trainer and owner. In 2005, the Texas Thoroughbred Association renamed both these stakes to honor a famous Texas Thoroughbred. The colts and gelding division at Sam Houston Race Park was named for Jim’s Orbit, who won the Grade 2 Ohio Derby and started in the 1988 Kentucky Derby. The fillies division is a tribute to Two Altazano, winner of the Grade 1 Coaching Club American Oaks in 1994. The accomplished mare, owned by the late Harold V. Goodman, also captured the 1994 Sam Houston Oaks with Hall of Fame jockey Pat Day in the saddle. Several talented 3-year-old fillies will make their stakes debut in the $65,000 Two Altazano. Douglas Scharbauer’s homebred Howboutthiscowgirl is one of two stakes winners in the field with a victory in the $65,000 Texas Stallion Stakes last November at Retama Park. The filly by Golden Song returns to Sam Houston Race Park following her close runner-up finish in $50,000 Bara Lass on January 28. She is trained by Bret Calhoun, who won last year’s Two Altazano with Archer City. Brian Hernandez, Jr. had the mount in the Bara Lass, but Calhoun had no reservations in naming current Sam Houston leading rider Lindey Wade to ride Howboutthiscowgirl Saturday evening. Shes Our Fastest, owned by Mark Norman and Norman Stables Inc., captured the $50,000 Evangeline Princess on September 2 and ran second to Howboutthiscowgirl in the Texas Stallion Stakes. The daughter of Oratory ships in from two tough races at Fair Grounds. Trainer Paul Duhon will give a leg up to jockey Anardis Rodriguez. Current leading Sam Houston conditioner Steve Asmussen has entered Little Prowless, a filly by Littleexpectations who is owned by his dad, Keith in partnership with Erv Woolsey. She won her debut here on February 24 by a solid three-length margin under Iram Diego. That was enough for the Hall of Famer to believe she deserved a chance to run at the stakes level. “It’s a big step up, but she ran very well in her first start,” said Asmussen. Shes a Texan, owned by Mike Powers, will make her ninth start and breaks from post position two under Chris Rosier. Trainer Mindy Willis, currently second to Asmussen in the Sam Houston Race Park standings, will saddle Outamoway Girls who makes her main track debut following a turf victory in November at Remington Park. Miss Bettylee, a Grasshopper filly trained by Danny Pish, who won her prep here on March 7, completes the six-horse field. The Two Altazano will run as the seventh race on Saturday night with an approximate post time of 8:48 pm. A field of eight colts and geldings will run six furlongs in the $65,000 Jim’s Orbit and several have proven their mettle in stakes company. Trainer Bret Calhoun has two colts entered: Galactica and Swift Shock. The two will break side by side in the Jim’s Orbit, but come into the race off very different paths. Galactica, co-owned by Carl Moore Management and Brad Grady, made his debut last June at Lone Star Park, winning two of his three starts, including the $106,000 Texas Thoroughbred Association Futurity on July 22. Calhoun has a solid record in the Texas-bred stakes, usually scoring with odds-on favorites, but Douglas Scharbauer’s homebred Swift Shock, lit up the toteboard odds of 44-1 in the $50,000 Groovy Stakes here on January 28. Jockey Lindey Wade, guided the son of My Golden Song, tracking the early leaders before swinging wide and mounting a huge rally. “We liked this colt from the beginning," said Calhoun. "He needed some time off last summer, and even though the prep race at Delta Downs (on January 5) didn’t look that impressive, he got what he needed to win the Groovy. It was one of the better Texas-bred stakes and I thought several would be tough to beat, but he showed up big time that afternoon." Will S. Farish’s homebred Direct Dial, was the even-money favorite in the Groovy, finishing second. He followed that with a third-place finish in the $125,000 Gazebo Stakes at Oaklawn Park on February 24. Sired by leading Texas stallion Too Much Bling, Direct Dial is the top money earner in the field with $119,320 bankrolled in six lifetime starts. Iram Diego will ride the gray colt from post position three. Redatory, owned and bred by James Wessel, will also return from his fourth-place finish in the Groovy. The son of Oratory was named Texas Thoroughbred Association (TTA) champion 2-Year-Old Colt/Gelding and is trained by former jockey Allen Dupuy. Sils, Just as Loud and two colts by Littleexpectations, Toledo Pache and Rock Pache, complete the field for the Jim’s Orbit, which will run as race nine. Post time for Saturday’s 11-race card is 6:00 p.m. (Central). The leading trainer, jockey and owner awards will also be presented. Steve Asmussen, has all but wrapped up the trainer title, which will be his tenth at the northwest Houston racetrack. Jockey Lindey Wade leads Iram Diego by 14 wins heading into the final two days of the season. This will be the second title for the 27-year-old rider, who finished in a tie with Quincy Hamilton in 2011. Leading owner honors will go down to the wire as Steve Asmussen and End Zone Athletics, Inc. are just two wins apart heading into Friday and Saturday’s action.